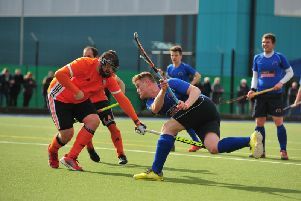 Harrogate Hockey Club Mens 1st XI returned from their final away trip of 2017/18 with a point to their name. Will Rogers’ team secured a 1-1 draw at high-flying Leeds 2s, who are gunning for promotion in their first season in North Division One. Saturday’s match started at a fast pace with the hosts looking to pile the pressure on what was a relatively young ‘Gate side, but the visitors defended well. And as the Ainsty Road outfit grew into the game, and they created the first real chance of any note, Andrew Clemerson hitting the post from a penalty-corner. At the other end, the home side made some headway down the left-hand side and were slightly fortuitous when an aerial ball into the D landed with a Leeds attacker who was left with a simple finish for 1-0. The lead did not last long however, as from a long corner, Clemerson turned provider for Jack Bass to finish in style. In the second half, Harrogate continued to deny Leeds any clear opportunities on goal, despite a flurry of cards being shown. It was actually the visitors who looked more likely to score with Toby Harris and Harry Henderson causing the West Yorkshire defence trouble and Charles Edmonson left to rue a couple of missed chances and what might have been. The result sees Harrogate climb further up the league table to seventh place, putting more distance between them and the relegation zone. Rogers’ side welcome Gateshead to Granby on Saturday (13.30), looking to avenge a 2-1 away defeat back in December.